Skinfold protocols were first developed back in the 1970s because of the need for a simple and inexpensive method of assessing body composition. The procedure involves measuring the thickness of folds of skin and fat at various body locations. These ‘skinfolds’ are lifted away from the underlying muscle with a pinching action of thumb and forefinger, and their thickness measured with specially designed calipers. The thicknesses at each site are added together and this total (‘sum of skinfolds’) is entered into a research-derived formula which then produces (‘predicts’) the percent body fat of the individual. Using this fat percentage and the weight of the individual, total muscle mass can then be calculated. A number of such prediction formulas have been developed, predominantly by comparing (‘correlating’) skinfold measures with already validated methods of body composition such as underwater (‘hydrostatic’) weighing. Among the most commonly used are those developed for adult males (Jackson and Pollock, 1978) and adult females (Jackson, Pollock, and Ward 1980). These are also the formulas used at MuscleSound. There are issues of accuracy with all these formulas, in terms of how well they each ‘predict’ body fat percent. However, the major sources of error in skinfold protocols is in the actual measure itself. Skinfold measures are probably the most frequently used of all body composition methods – but they are deceptively hard to take reliably. For example, if someone measures a triceps skinfold, and then measures it again after a brief pause, the result should be the same–this does not always happen! Differences in measuring the same skinfold site can occur between testers and, sometimes, even with the same tester over multiple trials. The methodology is more than simply pinching the skin somewhere around a particular area and measuring the thickness. There are precise sites on which the measurements are to be taken, and precise methodologies to be followed to maximize accuracy and reliability. While obtaining consistently accurate skinfold measurements requires training and experience, there are some error potentials inherent in the technique itself that can impact accuracy and reliability, regardless of the expertize of the tester. However, these sources of error do not occur with MuscleSound body composition assessment. This is because, even though we use the same prediction equations, our measurement methodology fundamentally differs from skinfolds. Ultrasound measures of subcutaneous fat, by their very nature, are far more consistent, accurate and reliable than skinfold measures. We have demonstrated the accuracy and reliability of this methodology with only a brief period of training. The remainder of this article lists the inherent error potentials of skinfold measurements and describes each one with comparative aspects of the MuscleSound protocol. According to Best Practice the ‘ideal’ fold has approximately parallel sides – just like these. But this is not always possible. Folds are not always easy to ‘lift’ and, sometimes, parallel sides are simply impossible due to the density of the underlying fat layer, or how much of it there is, or other conditions listed below. For example what if this is the shape of fold we get, even with the best skinfold ‘lifting’ technique? When this occurs, caliper placement is an issue for even the most experienced tester. Typically they will just use their best judgment and hope they can replicate the caliper placement on subsequent measures. Clearly this is not the best case for reliability! In contrast, with MuscleSound there are no ‘shape’ issues. 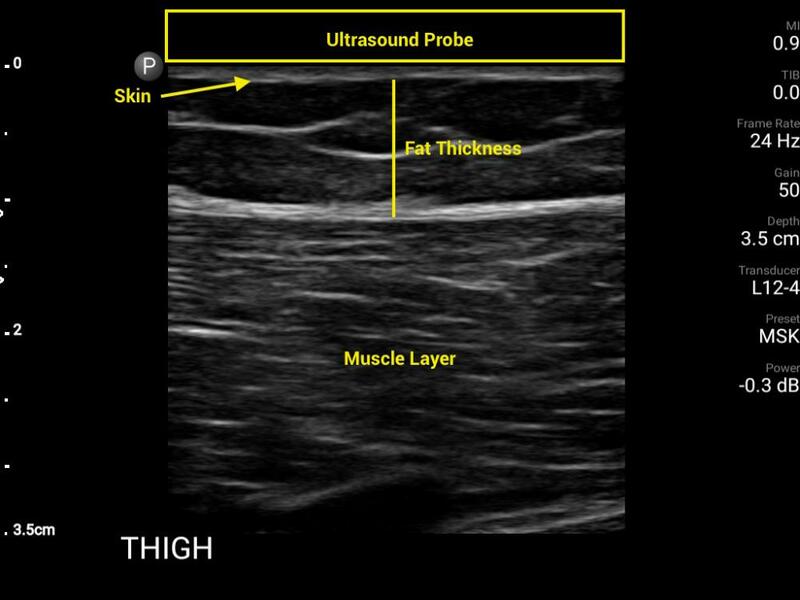 As illustrated by the graphic below, the Ultrasound probe is placed firmly and comfortably on the surface of the site to be measured and we take a direct, linear measure of the subcutaneous fat layer. As the skinfold calipers are placed around the fold, the fat layers compress in an amount proportional to the force exerted by the caliper. However, this force is not the same for all makes of caliper. For example force differences of between 240g and 740g have been reported for the five most popular models of caliper. Also, if calipers are not regularly calibrated, there is a danger of errors occurring between the same caliper models. The length of time caliper jaws are kept on the fold will also impact how much the fat layer is compressed. Skinfold Best Practice is 4 seconds. A shorter or longer time than this will result in a correspondingly greater or lesser reading on the caliper dial. When a fold is hard to lift and you are trying to get as close to parallel sides as possible, it is necessary to squeeze really hard! Since the caliper jaws have to be placed adjacent to where the fingers are located, this ‘Squeeze Force’ may well ‘locally’ impact the compressibility of the fold you are attempting to measure. For some individuals lifting a difficult fold is too painful for them to bear! Skinfolds can also be difficult – or even impossible – to lift because of a client’s ticklishness! In contrast, with MuscleSound there are no compression, pain or ticklishness issues. As illustrated by the graphic above, the Ultrasound wand is placed firmly and comfortably on the surface of the site to be measured and we take a direct, linear measure of the subcutaneous fat layer. For skinfolds to be ‘lifted’ effectively, the skin surface has to be ‘non-slip’. Sweat, body lotions, sunscreen and other body creams make it hard, and sometimes impossible to lift a fold, and hold it for the required 4 seconds. In contrast MuscleSound is not affected by sweat, or any kind of body cream acting on the skin. As illustrated by the graphic above, the Ultrasound wand is placed firmly and comfortably on the surface of the site to be measured and we take a direct, linear measure of the subcutaneous fat layer.